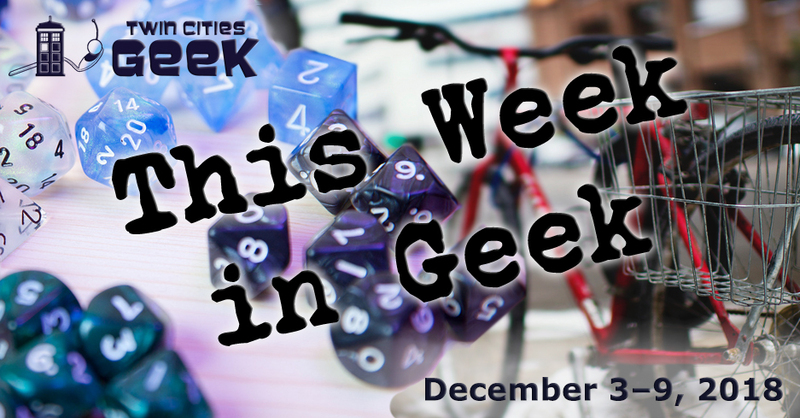 Welcome to This Week in Geek, your guide to events of interest to the Minnesota geek community for the week of Monday, December 3rd to Sunday, December 9th. When: Monday, December 3rd at 6:30 p.m. When: Tuesday, December 4th at 5:00 p.m.
Books and Bars is an “open public book club show” hosted and moderated by Minnesota Public Radio senior producer Jeff Kamin that provides attendees with “a unique atmosphere for a lively discussion of interesting authors, fun people, good food, and social lubrication.” The book being read and discussed this month is Anthony Bourdain’s Kitchen Confidential—the updated deluxe version—as an opportunity to revisit Bourdain’s work in the wake of his passing. When: Tuesday, December 4th at 7:30 p.m. When: Wednesday, December 5th at 6:30 p.m. The Speculations reading series returns with Scourge of the Seas of Time (and Space), a new anthology of pirate tales from Queen of Swords Press which will be released shortly, so come celebrate with an evening of pirate tales. The anthology’s editor, Catherine Lundoff, and a contributor, Michael Merriam, will be present to read from the book, discuss piracy, and hand out snacks. Shiver your timbers, and get on down to one of the greatest geeky shops in the metro area! When: Wednesday, December 5th at 7:00 p.m. When: Thursday, December 6th at 5:00 p.m.
First Thursday Films at the Capri Theater—a screening and speaking series—will be showing Detroit, a film focused on terrifying moments from the civil unrest that gripped Detroit in the summer of 1967, directed by Oscar-winner Kathryn Bigelow. The screening will be followed by a conversation lead by David Grant, a Twin Cities-based filmmaker, author, screenwriter, and playwright. Tickets are $5. Come see Terry Gilliam’s dystopian classic at the Parkway Theater. Brazil focuses on a lowly bureaucrat who has a rich dream-life eventually being pulled into a terrorist plot, and a complex web of lies. Tickets are $9 in advance or $11 at the door. This will be a 35-millimeter screening of the film, which is a bizarre visual treat showcasing Terry Gilliam at his best, and is worth a viewing for fans of strange cinema. When: Thursday, December 6th at 7:30 p.m.; Friday, December 7th at 7:30 p.m.; Saturday, December 8th at 7:30 p.m.; and Sunday, December 9th at 1:30 p.m.
Wicked Wenches Cabaret will be performing their holiday extravaganza featuring an adaptation of the Star Wars Holiday Special in a vaudeville style. “Vaudeville is adult comedy dance theater and is 18+ as there will be adult themes,” so only adults will get to see whether Chewbacca can get back to Kashyyyk to see family for Life Day. Costumes and revelry are encouraged, as there will be adult beverages and a photo booth! Tickets run from $15–30. When: Friday, December 7th at 3:00 p.m. and Saturday, December 8th at 9:00 a.m. The Holiday No Coast Craft-o-Rama is coming, and is a great opportunity to track down unique works of art and craft, and see the great works that local artists can create. This show has been held annually since 2005, and has been bringing great art to the Twin Cities. See the website for more information on artists, etc. Parking is available on the street and in a parking garage across from Midtown Global Market. When: Friday, December 7th at 4:00 p.m.; Saturday December 8th at 11:00 a.m.; and Sunday, December 9th at 12:00 p.m. When: Friday, December 7th at 7:00 p.m.
Join the Geek Partnership Society for a movie night revolving around the theme of connection through two very different films. The first film of the night is about the way lives impact each other over generations, and how a soul is slowly shaped from killer to hero. The second film follows two drag performers and a transgender woman across the outback as they perform their unique style of cabaret. This is a free event, but make sure to RSVP online. Come on down for an evening of tactical-mech combat! The United Geeks of Gaming meet Friday nights for a beginner-friendly session of the tabletop-mech game BattleTech at Fallout Shelter Arcade in Northeast. FSA’s Virtual World gaming pods also run the immersive video-game version of BattleTech. Where else can you while away an evening with mech-carnage? When: Friday, December 7th and Saturday December 8th at 7:30 p.m. The first two performances for this year’s production of A Klingon Christmas Carol are happening this Friday and Saturday night at the Historic Mounds Theatre in Saint Paul. Presented “in the original Klingon with English supertitles,” it will teach you the true meaning of honor in the face of the long night. General-admission tickets are $18, with VIP tickets for $35. Seating is reserved, and some performances sell out, so advance ticket purchases are recommended. When: Saturday, December 8th at 10:00 a.m.
Find something special for the people in your life at this holiday emporium featuring geeky artists, jolly old Saint Nick, snacks, music, and more, all helping the cause of bringing educational programming to youth. There will be treasures sold from auction vaults, including toys, art, games, and more. When: Saturday, December 8th at 12:30 p.m.
Bring the whole family for a magical holiday celebration with familiar princess characters! There will be dancing, stage performances, stories, picture opportunities, and more. This event proved popular enough that the original Sunday event sold out, leading to this overflow event, so interested parties should be proactive. Tickets range from $25–35. When: Saturday, December 8th at 4:00 p.m.
You are officially double-dog dared to not miss this annual holiday celebration at the Drafthouse. Bunny PJs are encouraged for this screening of A Christmas Story, the holiday classic with dangerously cold metal poles, Ralphie, and a child’s dangerous Christmas wish. Tickets are $12.99 and include interactive props. When: Sunday, December 9th at 10:15 a.m. and 11:15 a.m. When: Sunday, December 9th at 12:00 p.m. When: Sunday, December 9th at 12:30 p.m. Gender Jam—a meetup group for trans, gender-nonconforming, questioning, and intersex youth—will be meeting up for an afternoon of community and fun. This week, Gender Jam will meet up for Total Trans Take-Over of the Roller Garden! As always, bring your permission slip if you are under 18. When: Sunday, December 9th at 5:00 p.m. If you’re looking to make spirits bright this holiday, please note that throughout the season, Twin Cities Geek is organizing a Holiday Toy & Book Drive through December 11th to support great local organizations. See this link for more details, including local places where you can donate.